Bulbasaur, Squirtle, Pickachu and Charmander are rocking out with a Pokeball on this colorful licensed Nintendo Pokemon Pokeball backpack. 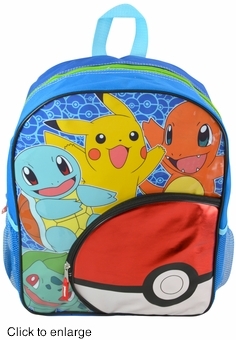 The large Pokeball on the front is a 3/4 zipper padded pocket perfect for many small items. The main compartment of the backpack is lined, has a bright green zipper and expands to a spacious depth of 5 inches providing plenty of room for loads of stuff. This Pokemon backpack measures 12 inches across and is 16 inches tall. Both funky and functional this awesome backpack also has a mesh elastic topped pocket on each side as well as adjustable padded arm straps and a hang/carry loop.